If you visited the Sarsen Technology Ltd stand at the Defence Security and Equipment International (DSEi) exhibition last September, you would have had the opportunity to add your business card to the hat and enter a prize draw to win a brand new iPad 3. Sarsen had hundreds of visitors to the stand at the exhibition at ExCeL, many with a keen interest in the embedded computing and data acquisition COTS hardware, software & systems supplied by Sarsen to the world’s leading defence & aerospace OEMs. The BittWare embedded COTS hardware featuring the Altera Stratix FPGA is a key technology solution supported by Sarsen Technology; Steve Dodsworth of Altera drew the winning card from the hat. The lucky recipient of the iPad 3 was Julien Loyer of Esterel Technologies. 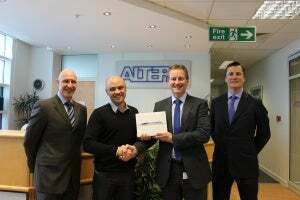 Julien had to wait until Apple released the iPad 3 until he could receive his prize at the Altera European HQ in High Wycombe. Image: Steve Dodsworth of Altera is pictured presenting the prize to Julien Loyer of Esterel Technologies.